Manage Users & Profiles: Users have the ability to grant team members access to profiles, reporting and administrative rights. Keep in mind this permission only allows people to manage within their assigned profiles. Invite Other Users: Managers can also be given the ability to invite new user to the team. We’ve made this a separate control because adding users affects your monthly Sprout bill and we understand that only certain individuals should have this option. You now have the ability to shut off reports for certain users so they can focus on parts of Sprout that are crucial for completing their daily tasks. Once you grant a user access to a social profile, they will be able to view it in any other groups they have it in. Download the Users & Profiles training guide. We also wanted to let you know that advanced set of permissions are available for select customers. 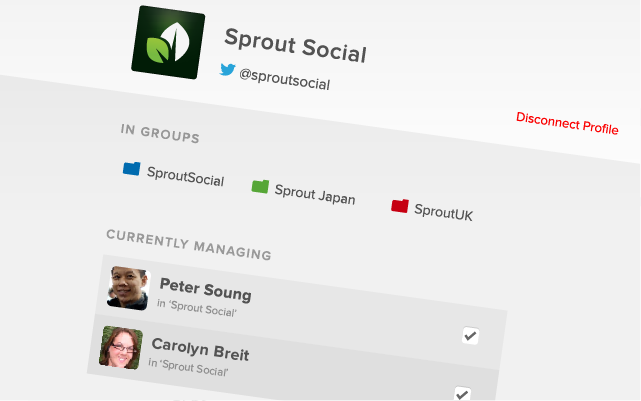 If you are interested in restricting access levels to social profiles, get in touch and we’ll give you a full rundown of the new functionality that Sprout is able to offer. As always, stay tuned for more updates, and if you are interested in learning more about this change, please attend one of our webinars. Product Team: At Sprout Social, we embrace and revel in the fact that social media is a crucial component of brand and customer relationships. Our team of dedicated engineers, marketers, designers, product specialists and customer service professionals work tirelessly to create an exceptional product for our customers.